Wing Chun is one of the most EFFECTIVE and PRACTICAL styles of the Chinese Martial Arts in use today. Wing Chun is the only style in the Chinese Martial Arts that was developed by a woman, especially for women! Requires no special strength or strenuous exercise program. Builds both spontaneous reactions and sharp reflexes. Develop Internal Power and the 3 inch punch. 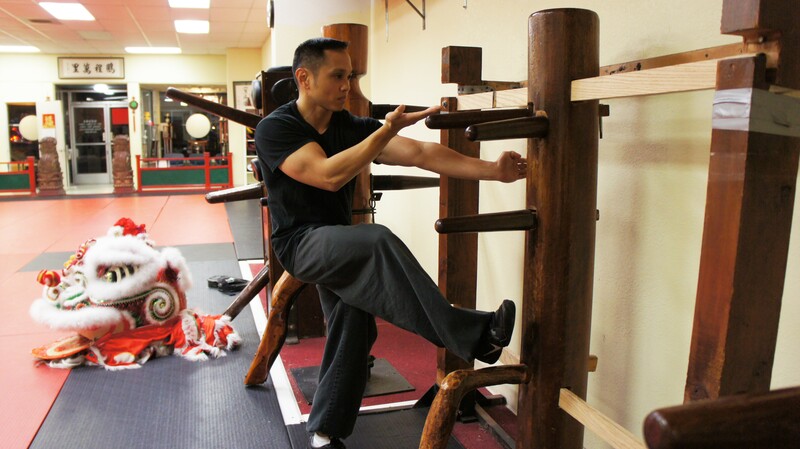 Learn fighting skills on the Wooden Dummy. Develop Lightning Fast punches (5-8 punches per second) at close range. Of all the various Kung Fu styles, Wing Chun is perhaps one of the most unique systems. Wing Chun was founded by a Buddhist nun, Ng Mui, of the famous Shaolin Monastery, over 400 years ago. The reason for developing a new style was she felt that all the other Kung Fu styles emphasized too heavily the “Horse Stance”, and relying on sheer brute strength and too many exaggerated movements. The training methods of these styles were far too strenuous and torturous for the men, let alone the women. So, instead, Ng Mui came up with a system of body dynamics and techniques that required the minimum of movements and energy. 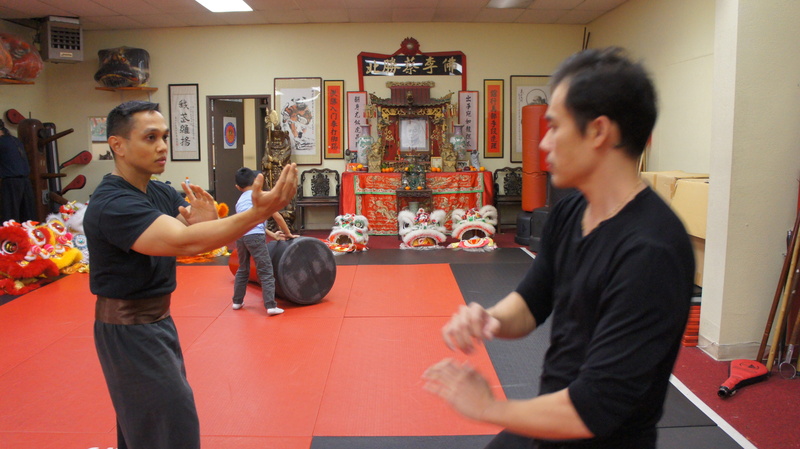 This was based on intrinsic (internal) energy, and stresses “center-line punching”, utilizing the fact that “the shortest distance between two points is a straight line.” Wing Chun reckons on practicality; Meek to overcome the strong and manipulation of the attacking force against the attacker. Great importance is placed on simultaneous attack, defense and counter attack, forever pressing forward with a series of fast punches and close-quarters footwork. This is designed to unbalance your opponent, without giving him a chance to recover. 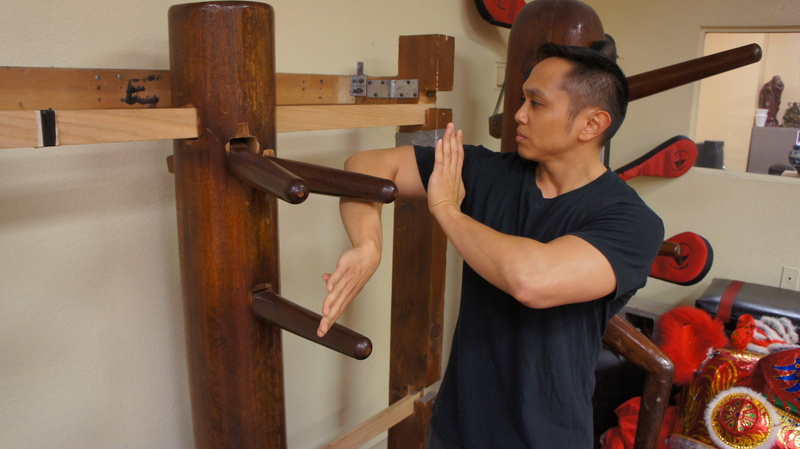 “Stand and Deliver”, rather than retreating is most important in Wing Chun fighting. The most important aspect of Wing Chun is a student is given the basic principles and from there forward they must build their own unique style, incorporating only what is within their own capabilities and disregarding what is awkward or inefficient. The Wing Chun style was named after a young female student of Ng Mui’s, Yim Wing Chun. At about the time Ng Mui was experimenting with her new fighting system, a certain boxer of the Shaolin style met her student, Yim Wing Chun. The boxer, Mr. Leung Bok Cho of Fut San, Kwan Tung Province, later asked for Yim’s hand in marriage. Ng Mui made a deal with him; if he could return after three years time and defeat Yim Wing Chun, he could marry her! He did return, but was defeated and ended up a student of Yim Wing Chun. Later, when the teacher and student became emotionally attached, Yim Wing Chun’s father gave his consent to their marriage. It was from her husband, Leung Bok Cho, that she learned the “Butterfly Knives,” known as “Bart Jarm Do” (eight slash knives), and the “Look Deem Boon Gwun”, (6.5’ stick) pole fighting. “CHI SAU” is a very unique form of exercise. A student who has undergone this training will soon understand, with relative ease, the principles of Wing Chun. The most important basics in Kung Fu are quick perception and spontaneous reaction, especially those of the hands. The “Sticking Hands Technique” precisely trains the perception and response of the hands, arms and the brain. In the “Sticking Hands Technique”, experts know that no more force than is desired is used. It trains mental alertness and instantaneous reactions through sensitivity in the hands. Chi Sau, “Sticking Hands”, utilizes what may be termed “elastic-springy-energy”, similar to a coiled spring as it unwinds. Wing Chun does not advocate contention of forces, but instead utilizes it’s opponents own force against themselves. 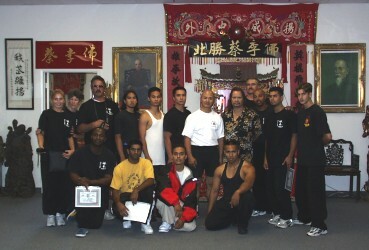 Therefore, in Wing Chun, one uses “deflect” and “parry” for defensive blocks, rather than applying force against force. Again, Wing Chun reckons upon practicality; Meek to overcome the strong, and manipulation of the attacking force against the attacker. Chi Sau assumes a fixed pattern, and in the cycle of changes, when it becomes a fluent and natural movement, the arms would act freely in attack and defense. The next higher stage in Chi Sau is free expression of movements as the hands respond to the opponents every move. 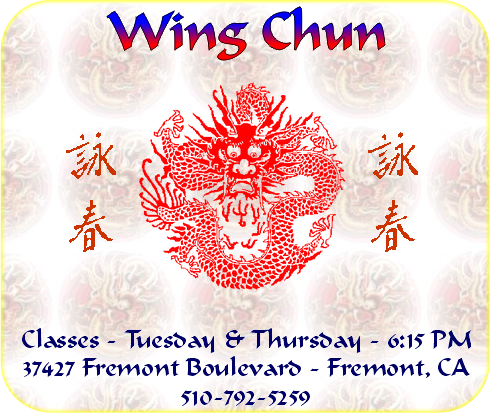 Wing Chun is one of the most popular and effective styles of Kung Fu today. Basically, it involves close quarter fighting with devastating low kicking techniques to the shins and kneecaps. This throws your opponent off-guard and off-balance, and at the same time immobilizes their kicking ability while you press on attacking with your hands. Our Wing Chun is a little different – (not soft) – it is designed to develop more intrinsic (internal – Chi) power in the shortest possible time by applying isometrics to our forms. The many two-person partner drills and extensive body conditioning develops strong limbs and fast reflexes. Theses enable the student to deal efficiently and effectively when defending themselves against an opponent. Develop power and speed you never knew you had. Learn discipline, respect and confidence while learning a unique and effective form of self-defense in a friendly, no-attitude environment.